SALT LAKE CITY WEEKLY TRIBUNE, December 11, 1884, p. 5. It was at one of Mark Twain's readings. The celebrated humorist was about to leave the hall. He looked thoroughly bored. His lugubrious aspect was as though he had lost his best friend, and his air of profound melancholy would have constituted a very important valuation in the stock of a first class undertaker. And yet beneath this woe-begone expression was that constant disposition to merriment suppressed. The only simile that would do justice to the look is Melancholy's struggle with Momus. He had just placed his hat on his head when a Mail and Express reporter accosted him. "Mr. Twain, how did you like your audience?" He gazed with an air of profound melancholy upon the reporter; took off his hat; gave a great sigh as of intense weariness, and sat down dejectedly. "Are there any more of 'em?" he asked. Another sigh, this time of relief. "How long do you intend remaining in the lecture field?" "I suppose I shall be out to grass until my friends take me in and chain me up. It's very hard to be a wanderer on the face of the earth at my age. You've no idea of the risks I run. It's actually flying in the face of Providence." "I don't follow you, Mr. Twain." "Thank heaven for that, anyway. I was fearful that you might. But if you don't, somebody else will. They all do it. Why, I found a Boston man away out in Colorado disguised as a waiter. He got his back up because I offered him a quarter, and wrote to his paper and said a lot of vile things about me; that I was 'no good,' and it was all owing to a packed jury that I didn't get into the penitentiary some years ago." "Do you find much difference among your audiences?" "Well, I think I see a change for the better in that respect," stroking his chin reflectively. "They don't quarrel so much among themselves as they did. I sp'ose they're getting used to me somewhat. Besides, I haven't got to pay for a bouncer and that's a saving. Yes, I observe a moral improvement, so to speak, particularly in Idaho and Montana. Maybe it's owing to the fact that during the past twelve months the mortgages on three churches have been foreclosed and two Sunday schools have amalgamated with other denominations. You might note these points of the 'observations of an experienced Philanthropist.' You needn't quote me as an authority, because my own personal reputation for veracity is very dear to me just now. It's worth a dollar for a reserved seat every time, in addition to a reasonable reduction for schools and seminaries. One can't be too particular when stating facts. Absolute accuracy has been the rule of my life." "I presume you are aware, Mr. Twain, that this interview is intended for publication?" "Is it, now? That's interesting." (with animation.) "I took the deepest interest in interviews when I was in harness. Why, sir, I consider the interviewer one of the most valuable auxiliaries of a newspaper office. Now, don't stop me, for I'm wound up on this subject, and I beg you'll not interpolate any superfluous verbiage until I'm through. Metaphorically put, I consider the interviewer as the literary Sullivan of the age. You can't knock him out. An interviewer who knows his business never takes it back, and the frightful aspersions on his veracity, which are recklessly made by enraged victims, are simply the noisy drivellings of a superb moral cowardice. It is simply appalling to a sensitive mind like mine, to see the monstrous libels that are hurled against these noble fellows, who regard with calm but magnanimous complacency all such unfounded attacks against their probity." "Why shouldn't I? Haven't I been through the mill myself? Haven't I sat and wept tears of ashes for hours on this very subject? Yes, sir, I have, and when I meet a fellow craftsman who perchance, has been bounced through the meanness of a canker-hearted politician I take him to my heart and weep and sympathise with him and cordially invite him to set 'em up." 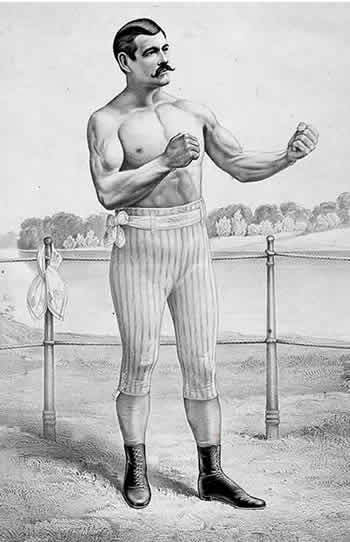 John L. Sullivan, United States heavyweight boxing champion from 1882 - 1892. From a Currier & Ives print from the Library of Congress Prints and Photographs Division.